I am interested in how advanced optimization and control methods can help integrate renewables, facilitate buidling-to-grid interactions, and foster efficient operation of our future smart grids and smart cities from the market level to the individual household appliance. I am also interested in energy sustainability and power system resiliency, on Earth and beyond. [J8] K. Garifi, K. Baker, D. Christensen, and B. Touri, "Non-Simultaneous Charging and Discharging Guarantees in Energy Storage System Models for Home Energy Management Systems", under review, 2019. [J7] K. Baker and A. Bernstein, "Joint Chance Constraints in AC Optimal Power Flow: Improving Bounds through Learning", IEEE Transactions on Smart Grid (to appear), 2019. [J6] K. Baker, A. Bernstein, E. Dall'Anese, and C. Zhao, "Network-Cognizant Voltage Droop Control for Distribution Grids", IEEE Transactions on Power Systems, Vol. 33, No. 2, pp. 2098-2108, Mar 2018. 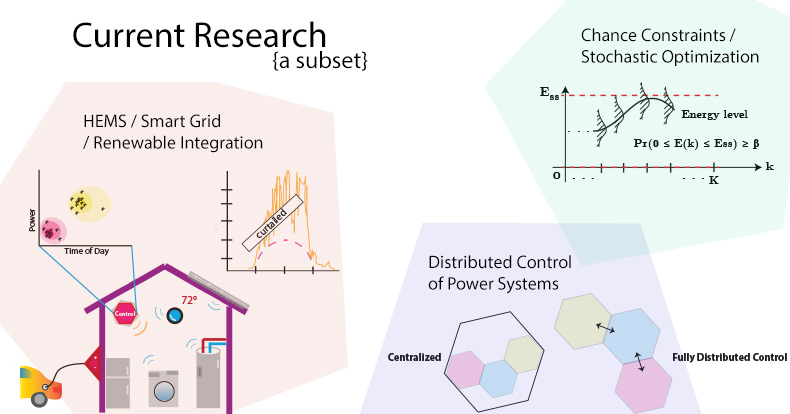 [J5] X. Jin, K. Baker, D. Christensen, and S. Isley, "Foresee™: A User-Centric Home Energy Management System for Energy Efficiency and Demand Response", Applied Energy, Vol. 205, pp 1583-1595, Nov 2017. [J4] E. Dall'Anese, K. Baker, and T.H. Summers, "Chance-Constrained AC Optimal Power Flow for Distribution Systems with Renewables," IEEE Transactions on Power Systems, Vol. 32, No. 5, pp 3427-3438, Sep 2017. [J3] K. Baker and B. Toomey, "Efficient Relaxations for Joint Chance-Constrained AC OPF," Electric Power Systems Research, 148 (2017), pp. 230-236. [J2] K. Baker, G. Hug, and X. Li, "Energy Storage Sizing Taking into Account Wind Forecast Uncertainties and Receding Horizon Operation," IEEE Transactions on Sustainable Energy, Vol. 8, No. 2, pp. 331-340, Jan 2017. [J1] K. Baker, J. Guo, G. Hug, and X. Li, "Distributed MPC for Efficient Coordination of Storage and Renewable Energy Sources across Control Areas," IEEE Transactions on Smart Grid, Special Issue on Distributed Energy Management Systems, Vol. 7, No. 2, pp. 992-1001, Mar. 2016 (444 submissions, 20 published). [C16] K. Garifi, K. Baker, B. Touri, and D. Christensen, "Stochastic Model Predictive Control for Demand Response in a Home Energy Management System," IEEE Power and Energy Society General Meeting, Portland, OR, 2018. [C15] K. Baker and K. Garifi, "Power Signature Obfuscation using Flexible Building Loads," 4th International Workshop on Non-Intrusive Load Monitoring, [Best Paper Award Honorable Mention], Austin, TX, 2018. [C14] Y. Guo, K. Baker, E. Dall'Anese, Z. Hu, and T.H. Summers, "Stochastic optimal power flow based on data-driven distributionally robust optimization," American Controls Conference, Milwaukee, WI, 2018. [C13] K. Baker, A. Bernstein, C. Zhao, and E. Dall'Anese, "Network-cognizant Design of Decentralized Volt/VAR Controllers," IEEE Innovative Smart Grid Technologies (ISGT), Arlington, VA, 2017. [C12] X. Jin, K. Baker, S. Isley, and D. Christensen, "User-Preference-Driven Multi-Objective Model Predictive Control of Residential Building Loads and Battery Storage for Demand Response," American Controls Conference (Invited Paper), Seattle, WA, 2017. [C11] X. Zhou, L. Chen, E. Dall'Anese, and K. Baker. "Incentive-Based Voltage Regulation in Distribution Networks," American Controls Conference, Seattle, WA, 2017. [C10] E. Raszmann, K. Baker, Y. Shi, and D. Christensen, "Modeling Stationary Lithium-Ion Batteries for Optimization and Predictive Control," IEEE Power and Energy Conference at Illinois (PECI), [Best Paper Award], Champaign, IL, 2017. [C8] K. Baker, E. Dall'Anese, and T.H. Summers, "Distribution Agnostic Stochastic Optimal Power Flow for Distribution Grids", IEEE North American Power Symposium (NAPS), Denver, CO, Sept. 2016. [C7] E. Dall'Anese, K. Baker, and T.H. Summers, "Adaptive Optimal Power Flow for Distribution Systems under Uncertain Forecasts"", IEEE Conference on Decision and Control (CDC), Las Vegas, NV, Dec. 2016. [C6] B. Palmintier, E. Hale, B.-M. Hodge, T. Hansen, and K. Baker, "Experiences integrating transmission and distribution simulations for DERs with the Integrated Grid Modeling System (IGMS)", Power Systems Computation Conference (PSCC), Genoa, Italy, 2016. [C5] F. Ding, B. Mather, N. Ainsworth, P. Gotseff, and K. Baker, "Locational Sensitivity Investigation on PV Hosting Capacity and Fast Track PV Screening," IEEE PES T&D, Dallas, TX, USA, 2016. [C4] K. Baker, G. Hug, and X. Li, "Optimal Storage Sizing using Two-Stage Stochastic Optimization for Intra-Hourly Dispatch," IEEE North American Power Symposium, Pullman, WA, USA, 2014. [C3] K. Baker, D. Zhu, G. Hug, and X. Li, "Jacobian Singularities in Optimal Power Flow Problems Caused by Intertemporal Constraints," IEEE North American Power Symposium, Manhattan, Kansas, USA, 2013. [C2] K. Baker, G. Hug, and X. Li, "Inclusion of Inter-Temporal Constraints into a Distributed Newton-Raphson Method," IEEE North American Power Symposium, Urbana-Champaign, USA, 2012. [C1] K. Baker, G. Hug, and X. Li, "Optimal Integration of Intermittent Energy Sources Using Distributed Multi-step Optimization," IEEE Power and Energy Society General Meeting, San Diego, USA, 2012. [P1] K. Baker, A. Bernstein, and E. Dall'Anese, "Network-Cognizant Voltage Droop Control," Patent Pending.